J.D. Byrider has supported Race for Riley for almost 15 years now. They're happy to be a part of such a great cause. J.D. Byrider has been a proud sponsor of Race for Riley Children’s Hospital for 13 years. The company supports many local charities and events, such as the Wounded Warrior Foundation, the local Lemonade Day and, most notably, the American Heart Association’s Heart Walk. Race for Riley, which is held at New Castle Motorsports Park, is a special event for employees, who got to cheer on their own J.D. Byrider Racing Team, who competed in the event and earned some top placements. Shannon Aldridge, director of franchise operations, won the Sponsor Race over John Andretti and Steve Petersen. In the Feature Event, driver Ron Petersen overcame an ill-handling kart late in the race to take the lead and the big win! The company was recognized twice at the Window World Progressive Dinner, and Crew Chief and company Director of Real Estate Steve Petersen was called to the stage. 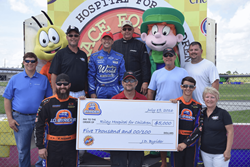 We’re proud of all our drivers and their efforts to support Riley Hospital. The team donated $5,000 on behalf of the entire company. J.D. Byrider is the nation’s leading franchised used car sales and finance business. The company was founded more than 20 years ago to serve customers with special auto financing needs, and to ensure they receive the same quality service in every J.D. Byrider dealership. With over 1 million customers matched with quality, affordable vehicles that are inspected, computer tested, serviced and reconditioned at our on-site service centers, the company continues to focus on reliability and customer satisfaction in all of its 169 locations. Visit GoJDB.com to learn more.